Wireless charging is the future, but it hasn’t gotten there yet. Well, it has to an extent with “wireless” charging pads and docks that don’t need to be wired to your phone, but still require contact with the device being charged. Thus, there’s plenty of room for improvement. 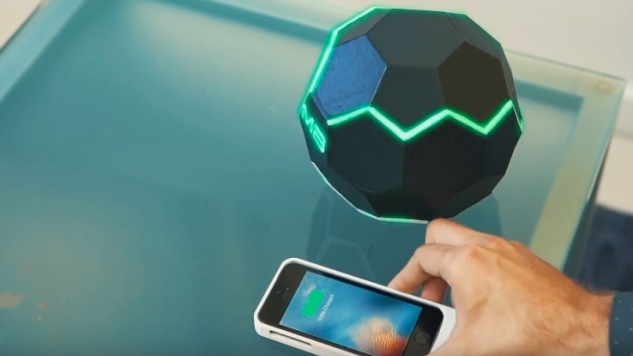 The MotherBox is a new wireless charging product that hopes to change all that. It’s the first product of its kind that isn’t tethered to your device, and it’s available now via Indiegogo. The stylish orb device allows you to charge your iOS or Android products simultaneously. Free movement is possible without the need for point-to-point contact and it’s adaptable for any size scenario. It’s as flexible as wireless charging should be. To add to its flexibility, there’s also the MotherBox Mini which is a portable wireless charger that runs on an external battery pack. It can send your device push notifications when its battery is running low, allowing you to set preferences on when you’d like it to charge. Otherwise, it’s delightfully hands-off in how it works. So, how does it make any phone wireless? That’s all conducted via a receiver. A thin accessory that plugs into the power port of your smartphone, it’s typically placed on the back of your phone in between your device and a phone case. For daredevil types such as myself that don’t use a phone case, it is possible to use the MotherBox without a case, but would be far less convenient. It’s similar in dimensions to a business card, ensuring it’s sleek and easily hidden. Any smartphone that has a Lightning connector, Micro USB or USB Type-C port can is supported. We talked to founder, Josh Yank, to find out more. Such thinking is what led to the MotherBox. Named after the device in DC Comics, that is essentially a sentient computer with a host of powers and abilities including gravity manipulation, telepathy, matter/energy manipulation and much more. It’s an immediately stylish and eye catching device but, more importantly, it packs a punch. Fortunately, given smartphones’ propensity to use similar forms of power ports, cross compatibility was straightforward for the firm to establish. As Yank explained, though, the company is currently in talks with many consumer electronic manufacturers around the world to integrate the technology behind the MotherBox. Range is currently set at about 10 inches for the MotherBox Mini and 20 inches for the MotherBox, with charging speed decreasing the further you get from the device. That’s a decent distance for most users, ensuring you can place the charger in your living room and move around a little, but it’s still far from the futuristic ideal of being able to walk into your home and have your phone immediately start charging. Being truly wireless is always going to be more advantageous than being restricted to cables that are prone to fraying and being a trip hazard. For many, the MotherBox could be a great solution, especially in households that own both Android and iOS devices. Currently available via an Indiegogo crowdfunding campaign, a pledge of $159 gets you one bundle of a MotherBox, MotherBox Mini, Receiver, and two USB cables, with $12 for each additional Receiver. For those just after either a MotherBox or MotherBox Mini, the price is $89. The campaign runs until March 18.